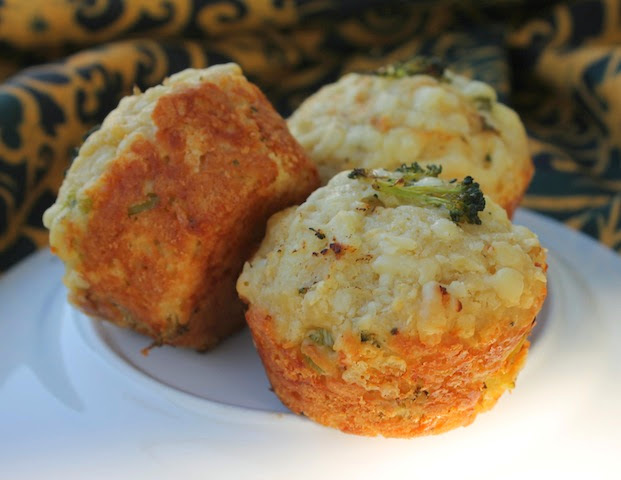 Cheesy muffins with broccoli make the perfect addition to a brunch menu. They are equally welcome alongside a bowl of soup for a light lunch or dinner. Happy Sunday! Your eyes are not deceiving you and don't bother to check your calendar thinking you have missed a day. It is indeed a muffin recipe a day early. Because this is a special week here at Food Lust People Love. IT'S CHRISTMAS WEEK! Which means that I have joined with a group of like-minded bloggers to bring you prizes to win from our generous sponsors and loads of great Christmasy recipes. We'll have sweet and we'll have savory but we'll all have delicious! 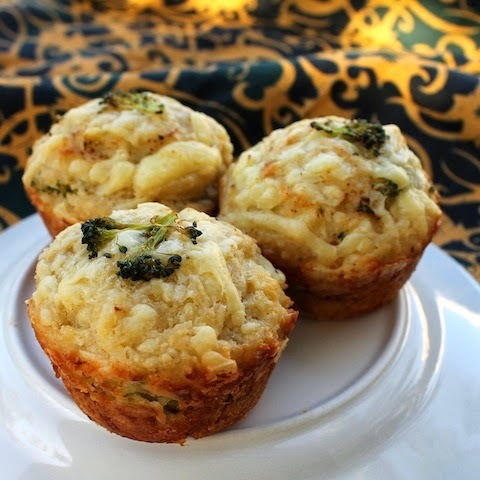 It starts tomorrow so come on back and I hope to see you munching one of these wonderful cheesy broccoli muffins as you sign up for the giveaways! Cut your broccoli florets into tiny florets and chop the stem bits into small pieces. Pan-fry them in a non-stick pan with a drizzle of olive oil for a just a few minutes. Set aside to cool. Preheat your oven to 350°F or 180°C and grease your 12-cup muffin pan liberally with canola, butter or non-stick spray. I don’t recommend using muffin liners when baking with cheese because the muffins are hard to remove from the paper. Grate your cheese. Put aside a large handful of about one ounce or 25g for topping the muffins. When the broccoli is cool enough to handle, count out 12 small florets for decorating the muffin tops and set aside with the handful of cheese. Put your flour, baking powder, pepper and salt in a large bowl. Add in the grated cheese and stir. Now add the bulk of the cooled broccoli and stir to combine. In another bowl, whisk together the oil, milk and eggs and Worcestershire sauce. Pour your wet ingredients into the dry ingredients and fold them together until just mixed. This is a really stiff batter, almost a dough. But trust. When the muffins bake, all that cheese is going to melt and you will end up with lovely tender muffins. Top each with some reserved cheese and a tiny floret of broccoli. Bake in your preheated oven about 20-25 minutes or until a toothpick inserted in the middle comes out clean. Cool on a rack for a few minutes and then remove the muffins from the pan to cool completely. If, despite liberal greasing, your muffins still stick to the pan, just run a knife around the outside of each muffin and they should pop free. Enjoy! See you back here tomorrow for the start of Christmas Week! Look at you with yummy, savory muffins, drooling!!! The cheesy ones are always my favorite, Tara! I know, right?! And I just baked next week's muffins this morning. The more I have to do, the more efficient I become somehow. Which is a darn good thing! It's another one of those British things. Like Welsh rarebit. You know, the melty cheese on toast that also has Worcestershire sauce? http://en.wikipedia.org/wiki/Welsh_rarebit It just popped into my head when I was making up the recipe. So then I had to add the sauce. Thank you, Ishita. I hope you make these for the Z-Sisters! I have never tried a savory muffin, but I love these flavors. This is brilliant Stacy! Thanks for the recipe. It's never too early to start them getting used to different spices and flavors. Bet he likes it! I love that you knew we were doing peppermint this month and still did a mint cookie last month. That shows you are a baker after my own heart! Pinning these--and I am so sorry I took a while to get over here. It has been that kind of month! Nope, not an oversight, Charlie, but thanks for asking just in case. There is no egg in the recipe. Yep, we love mint in any form! It's one of my favorite combinations too, Rebecka. Thank you! You should see the things I used to pack in my suitcase, Sophia! Fortunately, I can get MOST things in Dubai. Hope you bought some, Lane! They are wonderful! That's the way it is all over, Felice. Feast or famine! I tend to overbuy as well. They are very similar in flavor to the Andes Mints, Karen. Thank you for your kind words! Thanks, Becca! You are so sweet.